The 7D 30A SPST 120-277V NEMA3R 7-Day Electronic Time Switch features independent 7-day programming to provide flexibility for applications where load switching differs each day of the week. 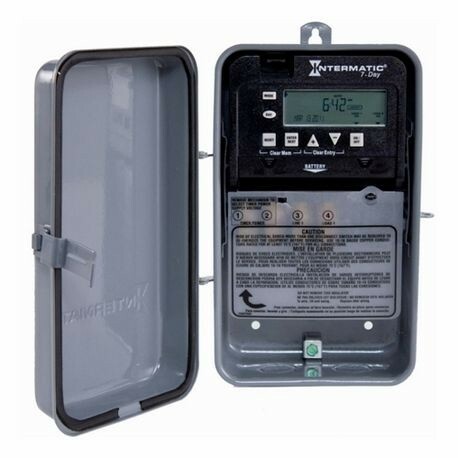 These time switches provide dependable and uncomplicated performance, plus to-the-minute programming for accurate load control and reduced energy costs. Up to 28 setpoints or events can be preset to automatically repeat. The program can be disabled at any time by placing the time switch in the Manual operating mode. Control buttons provide manual control of each circuit independently regardless of the operating mode. Each time switch is housed in a lockable enclosure to protect against vandalism and unauthorized tampering.